We joke about the fax machine being ancient history—a relic of the late 20th century and the dark ages before email attachments and cloud-based storage—but it really is pretty old. The earliest facsimile (from the Latin fac simile, “make alike”) device was invented in 1843 by Scotsman Alexander Bain. A clockmaker by trade, he used clock parts to synchronize the movement of a transmitter and a receiver for line-by-line "scanning" of messages and images. While Bain’s lab experiments were promising, Englishman Frederick Bakewell beat him to the patent office with his “image telegraph,” and Bain’s machine never took off. 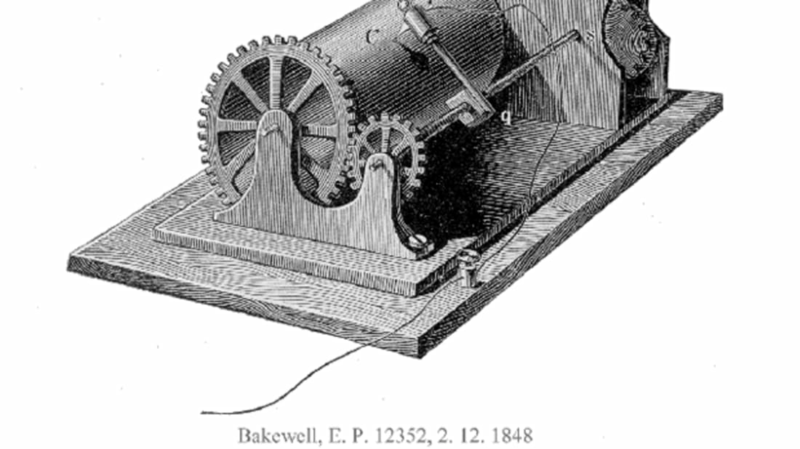 Bakewell’s machine sent the first successful “telefax” transmission in 1847. It could transmit handwritten words and simple drawings, but was of little use beyond demonstrations at the the Great Exhibition in London in 1851 because of long transmission times and unreliable synchronization. 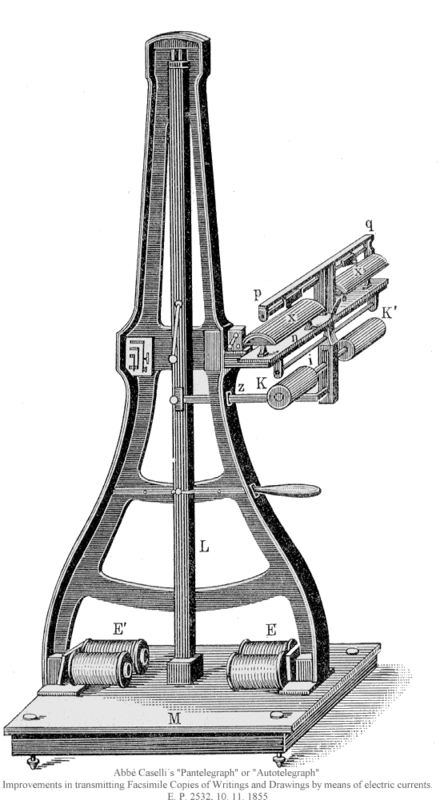 The first practical fax machine that saw sustained use was the pantelegraph, built in the 1850s by Giovanni Caselli, an Italian priest, physicist, and inventor (and a bit of a rabblerouser—while living in Modena as a tutor, he participated in demonstrations demanding the annexation of Modena to Piedmont and was tossed out by its duke). To use Caselli’s machine, the fax sender wrote a message or drew an image on a sheet of tin in non-conductive ink. The sheet was then placed on a plate where a transmitting stylus, in a circuit with it, scanned across it in a series of parallel passes. On the receiving end, another stylus, connected by telegraph lines, moved in synchronicity across a chemically-treated piece of paper. As it scanned, the transmitter would conduct an electrical signal when the stylus ran over the blank parts of the tin sheet and cut the current when the stylus hit the ink. The spatial pattern of the original message, translated into the starts and stops of the current, went over the wire to the synced receiver, and the chemical paper changed color where the current went through. The result: a perfect copy of the original. Caselli overcame Bain and Bakewell’s syncing problems with two regulating clocks and a pendulum that provided a time base for the parts that moved the styluses. If 20th century fax machines were bulky, Caselli’s pantelegraph prototype was monstrous. The pendulum alone weighed 18 pounds and hung in a 6-foot-tall frame made of cast iron. At a demonstration in Paris, the pantelegraph wowed not only the French scientific community, but also Emperor Napoleon III, who gave Caselli access to state-owned telegraph lines for long-distance transmission experiments. Using the Paris-Amiens line, Caselli sent an image of composer Gioachino Rossini’s signature over a distance of 87 miles. Soon after, the French government installed a permanent pantelegraph system on the Paris-Lyons telegraph line for public use, and later extended it to Marseille. In the UK, the system was added to the London-Liverpool line, and in Russia, Emperor Nicholas I used it on the telegraph line between his palaces in Moscow and St. Petersburg. The pantelegraph’s time in the limelight didn’t last long. The company that formed to operate the system in Paris failed to promote its services, instead thinking that investors and customers would simply be drawn by the novel technology. It didn’t help that, at such long distances, the pantelegraph succumbed to the same problems as Bakewell’s machine. Its slow transmission rate—roughly 12 words per minute—limited it to applications like verifying signatures for business transactions. Caselli’s improved synchronization method also faltered with the added miles, and the transmissions often came out illegible. As the pantelegraph faded out in Europe, it sparked curiosity elsewhere. The Chinese had little use for the conventional telegraph and Morse code since their language is made up of logograms instead of letters, but the pantelegraph provided a way to transmit their language and gave them an entry to the world of long-distance telecommunication. Chinese officials attempted to bring a pantelegraph system to Peking, but negotiations with Caselli fell through. A century later the same problem would spur fast and widespread adoption of the modern fax machine in Japan and the proliferation of Japanese-made machines in the world market. Primary image courtesy Wikimedia Commons.